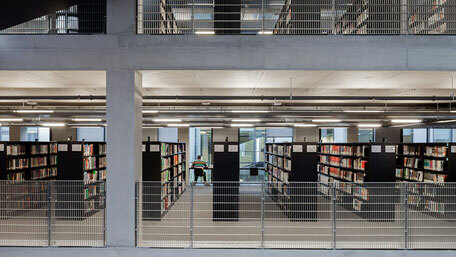 Designed by Ireland-based architects Heneghan Peng, the library features new book displays and static shelving specified in Bruynzeel's RAL 9004 ‘Signal Black’ across three of its four floors. The striking colour for the shelving was by no means a foregone conclusion. “The architects were looking at a dark grey for the shelves,” said Ginny Malone, Head of Library Services at the University. “We knew from the start that the colour palette the architects were working from was of an industrial tone. We knew there would be open ducting, steel, aluminium … and the inside was going to be raw concrete. The Library opened to students in September 2014. Full description and gallery of photos by Bruynzeel.